What Happens to M&A if Tax Reform Brings Home the Bacon? Tax reform is a hot topic these days, and one of the key issues is all of that overseas cash held by U.S. companies and how best to get it back onshore for domestic investment. This potential domestic investment could come in all shapes and sizes and would no doubt contribute to U.S. economic growth, or so the argument goes. A popular narrative that companies will use repatriated cash to fuel M&A is compelling. Money currently trapped overseas due to tax reasons could be allowed re-entry at a favorable tax rate, where companies will immediately start investing by buying up other companies to build their corporate portfolios and expand their operations. In other words, when companies have more money to spend, they will spend it, and M&A will be a primary beneficiary of that spending. A few high-level bankers have repeated this, as well as yours truly. The other major competing use case is share buybacks, where companies initiate repurchase programs and return that cash directly to shareholders. In the process, this would also help maintain or increase share prices. 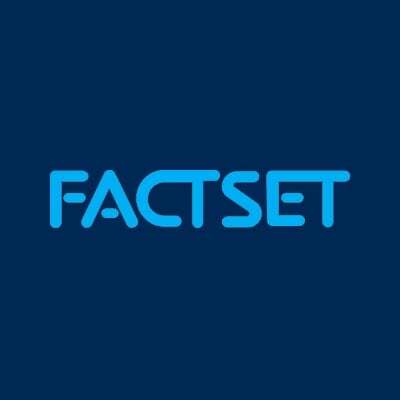 And of course, companies could just invest in themselves and use that cash to drive organic growth, which FactSet has recently highlighted as potentially the most rewarding option. Given the potential implications for M&A, let’s take a look at the data and see if there is anything there to support the notion of M&A growth from a cash homecoming. First, we can look at the level of cash held by companies in the S&P 500 using FactSet Market Aggregates and compare it to the total value of M&A transactions for those same S&P 500 companies on a quarterly basis since 1999. More specifically, the analysis uses the index constituents at the time for both aggregate cash and total M&A, the focus is on purchases of U.S. companies, and the payment method is all cash. This helps remove survivorship bias and sets us squarely on the target use case: cash spent on U.S. acquisitions. From this simple analysis, it shows that there is a positive relationship between the level of cash and the value of cash deals for U.S. companies. We can run this same comparison of aggregate cash held by the S&P 500 against the value of stock deals for U.S. targets by the S&P 500. 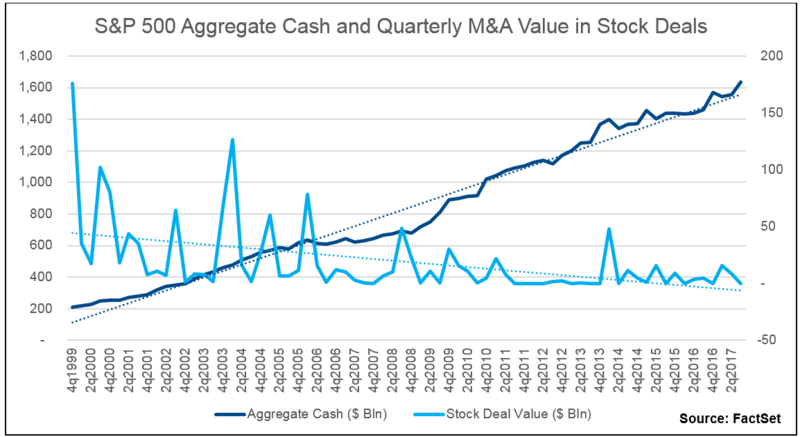 In this case, it is clear that there is effectively no relationship between aggregate cash and the value of stock deals for U.S. companies. This outcome is interesting because if the cash were trapped overseas, then there should be more stock deals. It is also interesting because with the current high levels of share prices, it would be easy to conclude that stock issuance would be an easy form of payment—companies effectively printing money for acquisitions. Clearly the cost of equity is influencing this, and recent studies have shown that selecting the wrong payment method can give away information in the negotiation. Buyers may also have learned from the mistakes of the dot-com era where stock was more heavily used to finance transactions. Before drawing any concrete conclusions, though, it is worth looking at the relationship between the S&P 500 and the aggregate cash held by the companies in the S&P 500. There is a healthy relationship over the past 18 years that results in an adjusted R-squared of 60.1%. However, it is worth noting that the relationship between aggregate cash and the S&P 500 is entirely post-crisis. This is clear in the trend lines that cross at Q1 2009, and since then aggregate cash and the S&P 500 have a relationship that results in an adjusted R-squared of a whopping 95%; they effectively move in parallel. 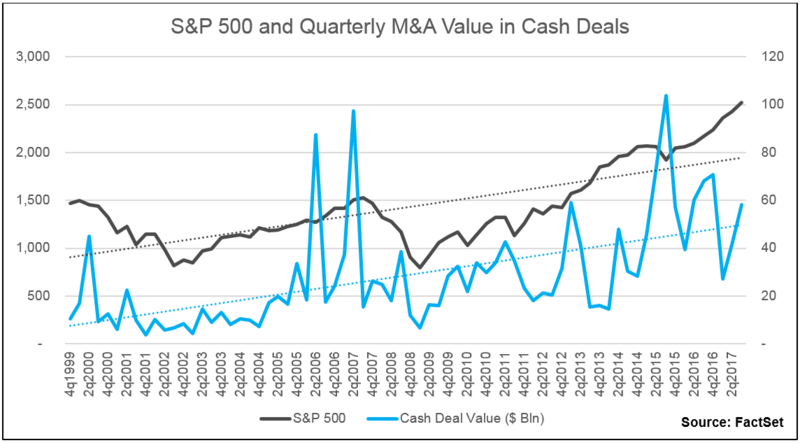 Finally, this last chart compares the S&P 500 against the value of M&A in cash deals. Though the trend lines are clearly parallel, what they hide is that the relationship is similar to that of aggregate cash and the S&P 500—it is stronger after the financial crisis. Admittedly, it is not a strong relationship, with an adjusted R-squared of only 30%, but that is significantly better than the pre-crisis adjusted R-squared of only 11.3%. What conclusions can be drawn from all this? 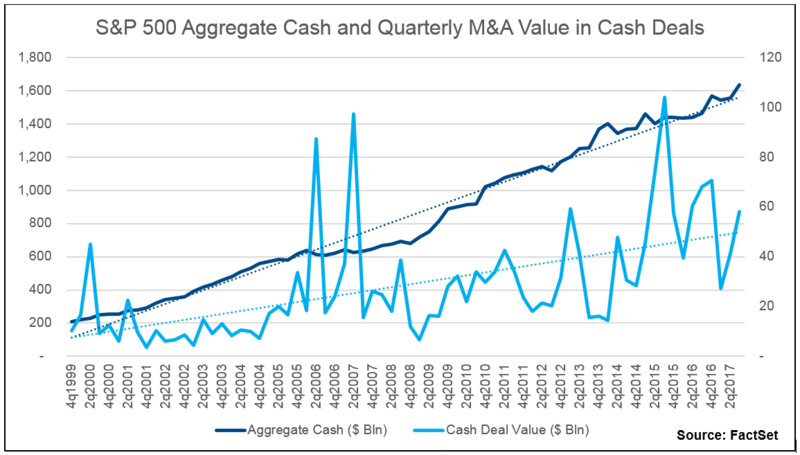 Ultimately, there is a relationship, though relatively weak, between aggregate cash and the level of cash deals, which may indicate potential for an increase in M&A. Certainly the lines both trend upward (but then again, so does my newly planted avocado tree). However, there is no guarantee that the repatriation of cash will suddenly drive M&A. If it were possible to analyze and compare offshore cash vs onshore cash against cash deals for U.S. companies, then there might be more clear variances in the impact to M&A. It is worth nothing that in today’s global markets that cash can still be used to make acquisitions overseas and/or pay overseas shareholders. And there is nothing that says the cash is actually trapped and inaccessible, just that it may have a cost associated with using it, which may purely be financing and transaction fees rather than tax rates. It seems likely that a return to pre-crisis normalcy, and an unwinding of the Fed’s massive balance sheet, are more likely to have an impact on deals than a simple cash repatriation holiday. Of course, if Washington continues to move at its current pace with tax reform, it may all be moot anyway and dealmakers will have to rely on other methods for fueling M&A growth. 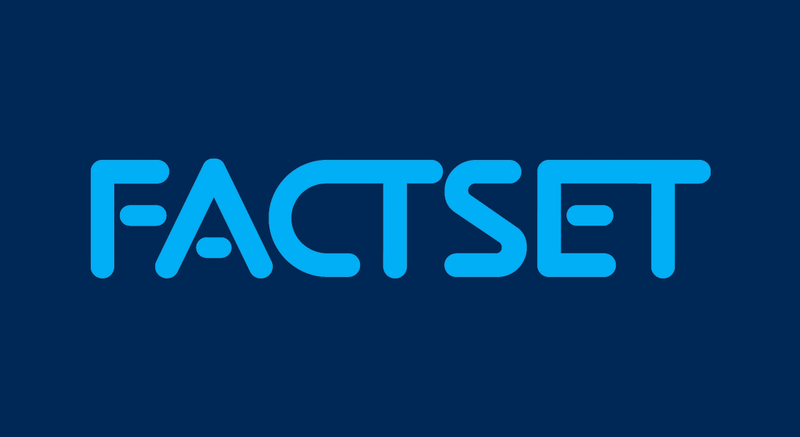 Bryan joined FactSet in 2003 and is based in London. 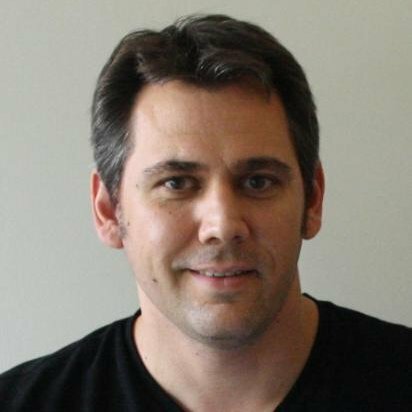 Bryan brings deep and varied experience in corporate strategy, management, financial services, international development, and enterprise content management to FactSet. As Director of FactSet M&A, Bryan develops FactSet's global M&A and corporate governance research, and works with private equity research and debt research teams to provide complete in-depth analysis to FactSet clients.